Motivational Thread - March 2 - 8....calorie counting versus intuitive eating? When did this happen??!? When did we go from instinctively knowing when we've had enough? This week, I'm challenging myself...and all of my fitday friends...to take a moment during each meal and check in with yourself. Have you had enough? Do you really need another bite or are you satiated with what you've eaten? I'm really going to try my best to tune into this signal and hope it doesn't fail me! LOL! I watch my children and when they've had enough...they've had enough. My husband grew up in a house where you were supposed to clear your plate, so his instinct is to tell the kids to eat what we've put on their plate. Me? I grew up in a house where if you're full, well then you're full! I never push the kids to eat more. I need to tune into that girl again. That girl who instinctively knew how to eat only what I needed...and no more. Truth is, I really don't relish the idea of counting calories forever. It's a struggle for me on a daily basis to track calories. I need to find a way to do this without tracking every single thing! For me, this is not sustainable! For others, it very well can be sustainable....but for me, it's not. Last year I lost most of my weight on what I called the "Honesty Diet". I stayed honest with myself and I lost all the weight I wanted to lose....but in the end I slipped up and gained it all back. I still haven't lost faith in the Honesty Diet...but I haven't felt strong enough to try it again just yet! So what has worked for you in the past? We're all different, so I'm curious to know what others have done or are doing. Did you count calories only...or did you also count steps with a pedometer? Are you using the same method this time around? (I'm assuming I'm not alone in losing weight and then gaining it back! ). Do you plan to count calories indefinitely? Good Monday morning all! I had planned to be up bright and early this morning to crank out an upper body workout...but started feeling crappy last night. I'm nursing a sinus/head cold, but I may still try to get in a workout...I'll see how the day progresses. Hoping that I stay injury free this week and make progress towards my personal goal! Sorry I tuned out over the weekend, I ended up resting a lot and getting caught up with some work things that needed to be done. It's the week before Spring Break here, which means I'm frantically catching up with everything so I can take it easy over the week off, or at least not fall behind, lol! I ended up 'working out' on Friday and Sunday last week, so I did hit my workout goal! I just walked at a normal pace on the treadmill for half an hour each time; my pulse did not get very high and I didn't necessarily feel like I was 'working out', but it felt good to be active and I will try to keep it up this week. Funnily enough, DH was extremely concerned that I started working out again and I had to convince him that it was okay for me to just walk for awhile. He's definitely more nervous than I am about the entire pregnancy, but then again, all he's able to do is spectate - he can't even feel what I'm feeling to have any sense of progress other than what I tell him, so I feel for the guy. I am starting to not feel as ravenously hungry as I was last week, though I am still very tired. I'm nervous about spilling the beans before 12/13 weeks, but I will be 11 weeks at that point if all goes well, and I likely won't see most of my family in person except on that day this year, so I feel like I can't miss the opportunity. What do you guys think? I am very open to suggestions. I am currently eating a lunch of chicken breast with a light homemade 'gravy' sauce, mixed with potatoes, peas, and carrots. It's kind of like a chicken pot pie without the crust, but it's very satisfying. Talk with you all soon!! Here's to a great week!!! Debbie: Good morning and happy start-of-the-new-week to you! Thanks for getting the thread up and running. I think you're absolutely right. We all need to determine what works for our own unique set of circumstances. Like you, I don't think I can do the intense tracking forever and ever, nor do I want to. My thinking (right now) is that, once I hit my goal weight (and maintain it for a few months), I'll still weigh daily but perhaps stop the daily calorie tracking. If the weight begins to creep up again, back we go to tracking. Like your husband, I'm part of the Clean Plate Club. It is virtually impossible for me to "leave a bit" or "push away when full". Acknowledging that fact, I made a household adjustment a few years ago -- I bought smaller plates for every day use. For company, we still use the more formal (in other words: big) plates, but for regular use, it's the smaller ones. Now, with my renewed interest in weight reduction and nutrition, I've gone one step further: smaller portions on the smaller plates. When we eat out (which is VERY rarely), I ask for a to-go container brought at the same time as my meal. Before taking even one bite, I divide the meal in two. Half stays on my plate, the other half goes into the to-go container. That way, I can be part of the Clean Plate Club while still not overeating. Well, not overeating as much . I've modified the Calorie Cycling a bit. I'm going to go for just one day. I think last week's goal was a bit ambitious. On the positive side, last week resulted in my breaking through that dad-blasted 3-week plateau. I had a 2 pound loss -- my biggest weekly loss since I re-started in September. My average since October has been just a hair under 1 pound per week (and, as I mentioned, February was stall-out city). Last edited by episode2011; 03-02-2015 at 11:27 PM. Reason: edited to add the new Explore! goal. Good news - My latest blood test showed improvement. Heh Terri, you snuck in while I was composing my last post -- wasn't ignoring you! On topic, I think it's very considerate of you to handle your announcement as you plan to. It sounds like a win-win for everyone (especially dear great-grandma!). Annette: Good for you for being able to identify some of the specific factors that contributed to the re-gain. I think that's a big step. Congratulations on the good blood work-up! That's always a good feeling! 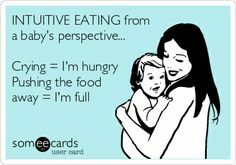 Intuitive eating....can eating a slice of pizza be intuitive Feeling crappy and all I want is comfort food and a long night sleep! Sorry you're not feeling quite as chipper as usual, Debbie. Here's hoping for a brighter day tomorrow for you. Splendid work there, Pianoman! Give yourself a big, ol' pat on the back! As for me, I think I'm going to amend my Goals for the Week to include some sort of exploration or experimentation. Today, for example, I tried a Minneola for the first time. For those who don't know, it's a tangelo (citrus fruit, cross between tangerine and pomelo or grapefruit -- looks similar to an orange). It is, without a doubt, the juiciest orange-y fruit I've ever had. Something I learned: do NOT eat one near your cellphone or computer and keep a napkin handy. You've been warned . I think doing research or trying new foods (or new combinations) a few times a week will help keep this challenge fresh -- maybe even exciting (...nah, let's not go that far ). I also grew up in a clean plate family, but my husband's mother was even worse when it came to filling up their plates and telling them to eat it all. She has also been overbearing in the past with my kids when we've been over there, and even lived with them at one point. It was rough. I've tried very hard to teach my kids that when they are full they don't have to eat any more. That was an awful big switch in thinking for hubs. For a long time we argued about it and I just told him if we force them to eat for the sake of eating they will end up fat just like us. If they want more, they take more. If they are full, they clean up and they're done. I wish I was in tune to my "done" feeling like they are. I need to relearn how to do that. Oh, and when the kids have friends over I tell them all at some point during the meal that they are not expected to eat everything if they get full. It is ok to stop eating whenever they want, or on the other hand to take seconds if they want. I think they appreciate that permission to not gorge themselves to be "polite". Epi, I don't think I've ever heard of a Minneola. I'll have to look for them at the store. Does it have part grapefruit in it, or does it just taste something like a grapefruit? i'm not sure I'm understanding your description completely. The reason I ask is that because of one of my meds I can't eat grapefruit. It sounds good though! Pianoman, Excellent job! Keep it up and you'll get to your goal in no time! Annette, good for you for improving on your blood results. That means you are doing the right things. You've found a few things you need to improve on where you slipped a little, and it's good that you can recognize those things. Terri, so glad to hear the pregnancy is still healthy and looking good. Very considerate of you to think about the bride before yourself and your own happy news. I'm sure she will appreciate that very much. Debbie, glad to hear your injury is improving. And, as always, you always have wise words to get us going for the week. I don't think I'll ever be able to intuitively eat. I think I will have to be a life long calorie counter. As soon as I stop counting I go haywire. As for me, I'm still trying to work out my emotional eating and why I do it. My Medicare Part B was supposed to start this month, but they didn't take the payment out of my disability deposit today, so I'm confused. I really want to get started in some therapy. i need it badly. I have not had an ounce of diet soda since I quit a couple weeks ago. I haven't gone back to the crystal light. Yesterday and today, though, I was sooooo craving the sweet fizz (water was NOT fulfilling anything for me) and I had 2 big cokes. Now I'm back to plain water and it's tasting much better to me tonight since I got the craving out of the way. I need to make more oatmeal packets and start drinking my atkins w/ milk again. I do better when I have those things at the ready. I had a couple brief messages with a lap band dr the other day, and he gave me some more good information. More stuff to think about. My goal this week is to not buy anything from McD's (especially large shakes!). I tried to stock up really well on different things for the kids for after school so I don't have to take them to the drive thru because the fridge and cupboards are bare. Sara likes Halo's but for a small bag they are $7 at walmart! I can't afford that. I splurged and bought a pint of strawberries for $2.50, which I thought was too pricey. Seems like fast food is always cheaper than the healthy stuff, and when you've got a quickly dwindling savings account from unemployment, cheap sounds really appealing. I bought bananas as well...those are always cheap. I'm going to go to Sprout's and see if they have halo's for cheaper...the girls really like them. They were only $2.50 for a bag a couple weeks ago at Fry's. if they were that price all the time, I'd buy them every week for sure. I'm rambling. Sorry. 3am and I've got racing thoughts again and it spills out my fingers onto the screen.